Easily Store and Access All of Your Nutraceutical Products and Ingredients—in Half the Space. Consumer demand for a wider range of all-natural, non-modified nutrients, dietary supplements, and herbal products continues to grow. Store your growing inventory of natural products in less space with ActivRAC® mobile racking. Plus get faster, easier access to everything in your inventory. ActivRAC® negates the need to extend climate-controlled storage, and is ideal for natural beverage storage and distribution. The system can assist with protecting your raw ingredients from airborne contaminants, so your product stays potent and lives up to its claims. Reduce the area required for ingredient and product storage and allocate it to other areas, including cleanroom facilities and equipment, filtered air systems, and aseptic filing. Reduce the space required to store nutraceutical beverage, product and ingredients. Learn more about ActivRAC and how it works seamlessly in climate-controlled storage applications. 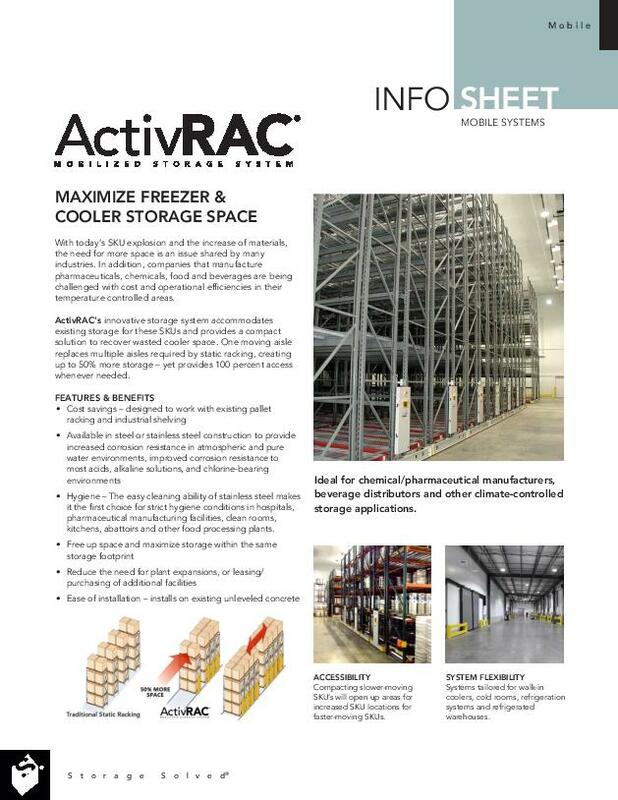 Just fill out this short form and we’ll email you immediate access to the full ActivRAC Freezer & Cooler Info Sheet.